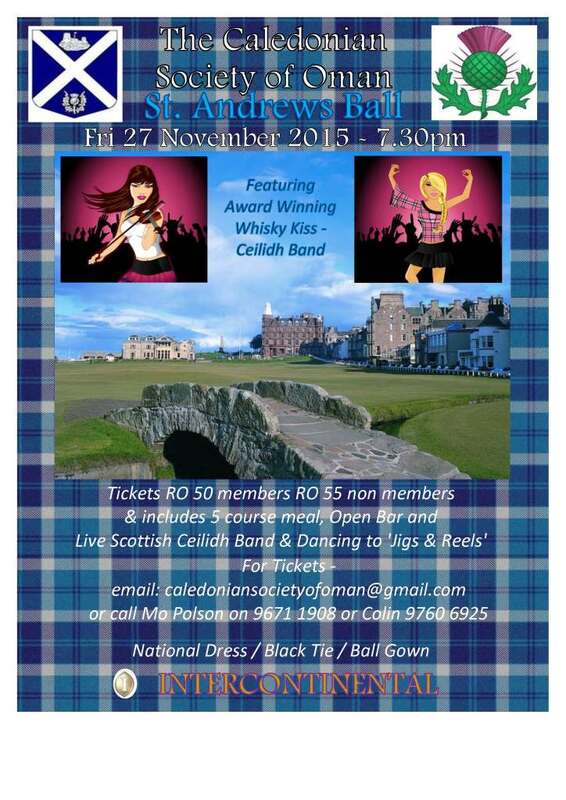 Tickets are now on sale for this year's St. Andrews Ball hosted by the Caledonian Society of Oman. The ball is once again being held at the InterContinental and is taking place on Friday 27th November from 7:30pm. Tickets cost RO 50 for members or RO 55 for non-members and includes a 5 course meal, open bar and live entertainment. The live entertainment comes in the form of a live Scottish Ceilidh band (Whisky Kiss) and dancing to what I'm told are "Jigs & Reels". Must be one of those weird Scottish things. 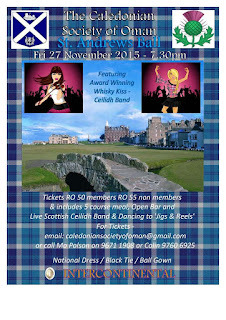 To get tickets email caledoniansocietyofoman@gmail.com or call Mo on 9671 1908 or Colin on 9760 6925. You can check out their website for more information. I'm also told that to become a member for the year costs RO 7 for a single membership or RO 10 for a family membership.